MAR 6th, 2018 VANCOUVER, BC: LinuxMagic is proud to announce that “ABC Communications” has chosen LinuxMagic's flagship “MagicMail” Carrier Grade Email Platform to service its ISP customers. ABC Communications prides itself on being the largest independent ISP in British Columbia and LinuxMagic is proud to announce this successful move to MagicMail, and the company's continued growth in not only foreign markets, but local markets as well. MagicMail has now been deployed to both Residential and Business customers of ABC Communications. The selection of MagicMail is the result of comprehensive research by ABC Communications' veteran management team, which is renowned in the telecommunications industry for operational and customer service excellence. ABC Communications has grown to be one of the most-respected and admired Telecommunications companies in BC. With over 8 offices spanning from Quesnel, Prince George and Vancouver, this family-owned business has grown into one of BC’s largest privately-held telecommunications solution providers. Built upon reputation, they have over 175 broadband broadcast sites across the province, stretching from the US border to Northern BC. ABC's fiber backbone links over 30 cities to centers in Prince George to Vancouver. "We had worked with various open source products for the past 20 years and we were never able to offer a proper carrier grade solution to our end users," said Chris, President of ABC Communications. "The transition was easier than expected, and support volumes are down now. Most importantly, our uptime is where it needs to be." Chris continued, “Moving to MagicMail as a platform for our customers was a great decision. I would strongly recommend other ISP's look at this product.” The MagicMail product is focused on serving the needs of telecommunications companies, and is the top selling Carrier Grade email platform for the North American ISP/Telco/Cable markets. Michael Peddemors, President and CEO of LinuxMagic, says, “Our new customer acquisition with ABC Communications further demonstrates our position as the market leader in providing a carrier grade email platform for the Telecommunications Industry. We have set the bar for ease of use, end user adoption, reducing support costs, and cost effective email delivery, along with overall ROI. MagicMail delivers on the promise of a reliable carrier grade email platform. We are all extremely pleased to be partnering and working with such a reputable Telco as ABC Communications." Himmy Lau, Director of Sales at LinuxMagic, says, "Today, customers expect an updated and reliable email solution from their ISP. By connecting with MagicMail, ABC Communications is addressing the needs of today’s connected customers that check their emails on smart phones and on webmail on average 6 to 20 times a day. Email is still the stickiest 'service' an ISP can offer it's customers, and providing reliable secure email communications significantly reduces customer churn." LinuxMagic is a wholly Canadian owned/operated Software development company based in Vancouver, British Columbia, with a long history of inventing and creating technology that is unique, innovative, and reduces customer pain points, and being chosen by an industry leader such as ABC validates their creativity and inventiveness. The company continues to be a leader in email, email security, and spam protection technologies. MagicSpam® PRO for DirectAdmin is Now Released! VANCOUVER, BC: LinuxMagic is proud to announce it has now released the MagicSpam PRO product line for DirectAdmin. This release increases the power and flexibility of MagicSpam by allowing DirectAdmin Hosting Providers the ability to not only enforce top level policies at the server level, but also allow them to gain global control over end user settings and defaults to allow for a much smoother process of administration. or via its worldwide Reseller community. DirectAdmin is a powerful and easy to use web hosting control panel running servers all around the world. For more details visit: https://www.directadmin.com. For media inquiries please contact the Head Office of LinuxMagic at (604) 682-0300 or via email to info@linuxmagic.com. LinuxMagic® is the Registered Trademark of Wizard Tower TechnoServices Ltd. MagicMail® and MagicSpam® are Registered Trademarks of LinuxMagic and Wizard Tower TechnoServices Ltd.
OCT 23rd, 2017 VANCOUVER, BC: LinuxMagic is proud to announce the hiring of Himmy Lau as Sales Director for LinuxMagic. LinuxMagic, the makers of industry leading technologies for the ISP, Telco, and Hosting Industries such as MagicMail and MagicSpam is very excited that Himmy Lau will be spearheading the growth initiatives of the companies products, as well as expanding the companies sales forces. This addition to the management team brings an extra high level resource reporting directly to the President/CEO. Himmy Lau was chosen for this role because of his strong background as a sale leader and his enthusiasm for the companies strategic direction and growth. Himmy will be in charge of developing go-to market strategies for the companies core product lines, as well as strengthening the core sales teams and developing sales channel strategies. Coming from a recent three year engagement with one of Vancouver's premier success stories at BuildDirect as Sales Manager, and with over seven years management experience at Shaw Communications, Himmy Lau understands the opportunities that LinuxMagic products and technologies have for the Cable/Telco/ISP Industries. LinuxMagic has spent the last few years growing out it's market share in the North American ISP/Telco space, with their MagicMail Carrier grade email platform, and has reached the stage of being a Top Selling mail platform for the Tier 2 & 3 ISP's and now is expanding it's footprint in the market, as well as targeting the Tier 1 ISP deployments. As well, LinuxMagic's Spam Protection products are sold and deployed in over 83 countries, and with 40% year over year growth in this division, the company is now focused on even greater expansion. Aside from working in a large telecommunications company in many leadership roles, including Regional Sales Manager, Himmy also understands work life balance, and when he isn't hard at work making change, he's very active in playing competitive basketball, spending time with his friends, family, his puppy and being a foodie in Vancouver. Having the opportunity to work so near his home in downtown Vancouver allows him to have that great life balance. LinuxMagic Software (a division of Wizard Tower TechnoServices Ltd.) is an internationally renowned Canadian company specializing in developing email and spam protections solutions for the ISP, Telecommunications and Enterprise markets. From their award winning MagicMail Email Server platforms, to their MagicSpam Anti-Spam technologies, LinuxMagic helps and protects millions of users worldwide. LinuxMagic's highly qualified development team, dedicated to Open Source software, has contributed to the recognition of LinuxMagic as one of the premier Linux Support and Linux Solution Providers. Wizard Tower TechnoServices Ltd. ("Wizard IT Services") a federally incorporated company located in Vancouver, British Columbia, is known for it's early adoption of new innovative ideas. With years of background in Internet Technologies and Software Development, and their expertise as a Linux Support House, they have been developing innovative solutions since 1997. It's corporate relationships with Canadian and International firms, have continued to grow, and the exports of it's software products, services and offerings has reached international scope. LinuxMagic® is the Registered Trademark of Wizard Tower TechnoServices Ltd. 'MagicMail' and 'MagicSpam' are the Trademarks of LinuxMagic Software and Wizard Tower TechnoServices Ltd.
All other trademarks mentioned herein are the property of their respective owners..
SEP 20th, 2017 VANCOUVER, BC: LinuxMagic is proud to announce the latest release of it's flagship carrier grade email platform “MagicMail”, the email platform of choice for hundreds of ISP's and Telco's across North America. This latest release brings exciting new features to it's industry leading platform and the millions of customers who rely on it. MagicMail is a complete Email platform specifically designed for the needs of ISP's , Telco's and Cable companies who need to offer a Best of Breed email experience to their customers in this highly competitive landscape, while providing the best in Spam protection, user experience, stability, security and scalability. VANCOUVER BC – OCTOBER 12, 2016 - LinuxMagic® is pleased to announce their latest release of the Top Selling Carrier Class Email server platform, MagicMail®. This latest version of MagicMail brings enhanced protection, performance, and administrative improvements to ISPs, Cable, and Telecommunication Companies throughout North America and beyond. Recent months have shown an ever increasing rise in attacks originating from the Internet of Things resulting in increased work loads and risks to ISPs and their customers. To help combat the overhead faced by Email Operators and the risks faced by their customers - MagicMail 2.0.5 introduces new protections against compromised IoT devices. Along side these new protections, MagicMail 2.0.5 brings system performance improvements through optimization of back-end services and enhancements to its anti-spam system, administrative user interface improvements to aid Email System Operators in delivering exemplary and timely customer service to their clients, and end-customer centric enhancements to help customers make more effective use of their Email. MagicMail is a self-hosted mail server designed specifically to enable ISPs, Cable and Telecom companies to have more control over their data, block spam, and provide their customers with a simple-to-use carrier-grade mail platform. In order to meet the evolving market needs of email consumers, LinuxMagic provides their fully-featured mail-server with all of the company's custom tools and spam protection at no extra cost. This includes additional support for anti-spam, and anti-virus scanning, high volume mailing, pro-active user protection, and a complete, easy-to-use management and user interface to allow further customization. LinuxMagic understands that it is vital to work with a company that specializes in email to meet the changing needs of their users. Backed by over 10 years of experience as email experts, MagicMail continues to be the top selling self-hosted mail platform in the US telecommunications markets that millions of users and hundreds of ISP types trust to make email simple again. For media inquiries please contact the Head Office of LinuxMagic at (604) 682-0300 or via email to info@linuxmagic.com to book an appointment. Linux® is a registered trademark of Linus Torvalds. LinuxMagic® is the Registered Trademark of Wizard Tower TechnoServices Ltd. MagicMail® and MagicSpam® are Registered Trademarks of LinuxMagic and Wizard Tower TechnoServices Ltd.
VANCOUVER BC - JANUARY 28, 2016 - LinuxMagic® has announced the latest release for their popular mail server platform, MagicMail®. The latest version of MagicMail features additional user functionality, improved browser support, and graphical interface enhancements. The release was a direct response to public user suggestions and customer feedback. LinuxMagic, located in Vancouver BC, is constantly improving the email experience for users worldwide. Their self-hosted mail server is designed specifically to enable ISPs and Telco companies to have more control over their data, block spam, and provide their customers with a simple-to-use carrier-grade mail platform. "We are very proud about the newest version of MagicMail as many of the features released were taken directly from customer requests," said Michael Stathers, Product Support Manager at LinuxMagic. "We always find the feedback from our customers to be incredibly valuable for our development team. That is why MagicMail is a mail platform made by ISPs for ISPs." "Just wanted to drop a line to [the Support Team] about how much I am loving MagicMail," states Donald McArthur, Senior Network Technician at Cap Rock Telephone Cooperative, Inc. "We haven't been switched over long but it has already saved me hours and hours of work." LinuxMagic understands that it is vital to work with a company that specializes in email to meet the changing needs of their users. With over 10 years of experience as email experts, MagicMail continues to be the top selling self-hosted mail platform in US telecommunications markets that millions of users and hundreds of ISP types trust to make email simple again. VANCOUVER, BC: LinuxMagic is proud to announce the latest release of MagicMail, version 2.0.3-1 today, which includes several improvements and features based on customer feedback. MagicMail is a full-featured mail server solution for ISPs and Telcos. The extensive list of built-in features and anti-spam technologies provide industry-leading mailbox protection while providing ISPs and Telcos lower total cost of ownership through reduced overall customer support volume, lower bandwidth consumption and lower hardware and licensing requirements. MagicMail continues to be the top selling on-premise Carrier Grade email platform, and millions of users and hundreds of Internet Service Providers of all types trust not only the stability and performance of MagicMail, but rely on the 'Making Email Simple Again..' philosophy. And with the increased use of email on almost every device, the "Internet of Things" has made it even more important to have an 'on premise' mail platform. This realization has generated a lot of demand from Telco's looking to move away from outsourced solutions, back to in-house solutions, so it is important to work with a product and a company that specializes in this model. And of course, the nature of email and spam protection is always evolving, and never more in demand than it is now so it is important to have a Vendor that is always releasing improvements and new features, and this release is continues the tradition of delivering continued improvements to our customer base. VANCOUVER, BC: LinuxMagic is proud to announce the latest release of MagicMail, version 2.0.3 today, which introduces a new GUI for mail queue viewing and searching, and other improvements based on customer feedback. VANCOUVER, BC: LinuxMagic is proud to announce the latest release of MagicSpam spam protection, version 1.0.8 today, which introduces a complete new user interface and new updated spam protection definitions. MagicSpam is the "Simple to Buy, Simple to Install, Simple to Use" spam protection released as a standalone installable spam protection package for some of the world's most common email platforms and MTAs including Plesk, cPanel, MailEnable, Zimbra and more. MagicSpam works differently than most spam protection products, in that it integrates directly into the email platform's SMTP layer, which means it can reject the spam messages before the server has to process the contents. And while MagicSpam has always had full logging, statistics and other tools, in addition to its spam protection features, the new UI makes all of this available in an even more user friendly format. As well, it makes customizing the spam rules simpler and easier, allowing even more flexibility for server administrators to "tweak" the performance for their particular environment. President/CEO Michael Peddemors reports, "There has always been a need for a low cost integrated spam protection solution that works directly in the email platform, but with the every changing face of email requirements and the changing nature of spammers, MagicSpam has always prided itself of constantly re-inventing itself and its effectiveness. This release makes it even more of a joy to use for system administrators"
MagicSpam is designed and licenses on a per server basis, for unlimited users and unlimited domains, for a single low "pennies per month" pricing model. It is also simple to install and use, and doesn't require any DNS changes, firewall changes, and can even work in conjunction with other built-in native filtering if desired. With simple server wide policy and spam management, MagicSpam reduces overhead, bandwidth, support and problems for the email administrator. And for platforms where the MagicSpam PRO versions are available, it even allows individual end users to manage their own spam settings, and offers other email security features both inbound and outbound. All in a fashion that doesn't create the fallout of other spam protection methods, such as backscatter and mail delays. MagicSpam 1.0.8 is available for purchase at http://magicspam.com or via your favorite reseller. Wizard Tower TechnoServices Ltd. ("Wizard IT Services") a federally incorporated company located in Vancouver, British Columbia, is known for its early adoption of new innovative ideas. With years of background in Internet Technologies and Software Development, and their expertise as a Linux Support House, they have been developing innovative solutions since 1997. Its corporate relationships with Canadian and International firms, have continued to grow, and the exports of its software products, services and offerings has reached international scope. LinuxMagic® is a registered trademark of Wizard Tower TechnoServices Ltd.
MagicMail® and MagicSpam® are registered trademarks of LinuxMagic Software and Wizard Tower TechnoServices Ltd.
All other trademarks mentioned herein are the property of their respective owners. JULY 24th, 2013 VANCOUVER, BC: LINUXMAGIC is happy to announce that they will be a sponsor at this years Tri-State Telecom Conference to be held in Sun Valley, Idaho. From July 29th to July 31st, come and visit LinuxMagic at it's display booth. showing the 300+ expected attendees the importance of email and spam protection in the ISP and Telecom Industry by demonstrating such products as our Carrier Grade MagicMail Platform and discussing the latest features in the new MagicMail 2.0 Release. This latest version of "MagicMail", the leading commercial email platform for Telco's and ISPs throughout North America, has been released and LinuxMagic is eager to meet it's many current customers, partners that rely on MagicMail for their customers needs. And the Tri-State conference is a great place to do this, as it brings much of the industry from three states altogether to discuss ways to improve the business. And this also gives a chance for new potential customers to speak with happy MagicMail attendees as well, so they can learn how switching can be simple and easy, while reducing costs, management headaches, and simplify all the email problems, including the provision of integrated Spam Protection, and modern day email requirements for their users. Spokesperson Dale Mounsey was reported as saying how excited he was to be attending this event. "We have done incredible things for Telco's and have a proven reputation for making email simple again, and our customer love us. But what makes this event exciting, is being able to share ideas and roadmaps, with so many thought leaders in the area's Telecom industry." LinuxMagic CEO, Michael Peddemors also had this to say. "The Telecom hasn't always given the importance to good email that they should, and have been hampered with trying to use 10-15 year old email technologies. The world of email is much different today, and you have to have a modern system. Remember, the number one use of smart phones is to check email, you have to make sure you keep up. It can be your loyalty tool, or it can be the reason people leave you. The trend away from desktop computers hasn't changed this, and your email technology has to keep up". The Tri-State Telecom Conference is always a wonderful event to learn about ways to improve the Telecom business, and this year is sure to exceed it's reputation. In between all the work shops, and other exciting events, please make sure to visit the team at their booth, and they can help you learn more from the email experts at LinuxMagic. LinuxMagic looks forward to seeing it's satisfied friends, customers and partners at the 2013 Conference. LinuxMagic® is a leader in developing email and anti spam solutions for the ISP, HSP, Telco markets and has been serving the ISP and Telecom industry since 1997. From it's flagship MagicMail product, to custom development projects, it's dominance in the market is the result of high quality products, and great customer support. The Tri-State Telecommunications Conference is an annual conference sponsored by the Idaho Telecom Alliance, the Utah Rural Telecommunications Association and the Wyoming Telecommunications Association. The conference rotates each year between the three states, allowing participants the opportunity to visit some of the most beautiful resorts in the country. VANCOUVER, BC: LinuxMagic is happy to announce the release of its highly anticipated MagicSpam PRO for WHM/cPanel. This spam protection product for the hosting industry is the latest in a series of spam protection tools that LinuxMagic has ported from their acclaimed MagicMail product line, and now it is available for all cPanel Hosting Providers, so that they can offer spam protection done right, directly to their customers, in a cost effective, easy to deploy module that fits with their business needs, and makes it simple to add MagicSpam protection to their platform, as a value added service. HSPs know how competitive the hosting market is, and any other product that can help them increase their monthly revenues will put them over to top against their local competition. At the same time MagicSpam Pro for WHM/cPanel allows for the individual customers to manage their own spam protection, thus decreasing administration time and cost, and increasing customer loyalty and user empowerment. Chief Technology Officer Shaun Johnson was quoted as saying... "This Edition of MagicSpam is a great step forward. We have taken into account the need for the Hosting Provider to have a great deal more flexibility and control over how they want to use our software: either as a value added service, a general protection layer to reduce bandwidth costs, or a mixed environment for both." He further adds, "with the added ability for end customers to manage their own settings, this reduces the need for the Hosting Provider to get caught up in day to day maintenance tasks and get back to providing excellent hosting services." MagicSpam Pro for WHM/cPanel comes with not just individual user controls but also with all of the features of our renown MagicSpam for cPanel (basic edition) such as lowered bandwidth use, zero day protection, reducing 'back scatter' and much more! MagicSpam Pro for WHM/cPanel release was driven by customer demand, to help Hosting Service Providers not only stop spam BEFORE the server has to process it, but make additional revenue as a value added service to their customers. Aaron Wuerch, Inside Sales Manager for LinuxMagic, adds... "MagicSpam Pro for WHM/cPanel is a HOT product for the cPanel users. It allows owners of WHM to provide or up-sell spam protection to their customers in a simple to use, simple to install native WHM module. It handles unlimited users, unlimited domains all for one low monthly price without having to change anything and helps to protect the data-center, and retain customers". MagicSpam for WHM/cPanel comes complete with full statistics, logs, log searching, custom whitelist/blacklists and much more. Simple to Install, Simple to Use and Simple to up-sell! LinuxMagic® is a leader in developing anti spam solutions for the ISP, HSP, Telco markets. As a member of the Canadian Anti-Spam Task force and the number one Linux® Development house in the Pacific Northwest, LinuxMagic® continues to provide technology specifically targeted towards customers looking for simpler integrated solutions for their mail services. For more information on LinuxMagic® please visit www.linuxmagic.com. MagicSpam® and LinuxMagic® are registered trademarks of Wizard IT TechnoServices Ltd. cPanel® and WHM® are registered trademarks of cPanel®, Inc. LINUX® is a registered trademark of Linus Torvalds. OptimaNet uses Parallels Plesk Panel together with MagicSpam from LinuxMagic to significantly improve customer satisfaction at its hostfactory.ch web hosting business. OptimaNet Schweiz AG, a leading Swiss provider of online services, uses Parallels Plesk Panel with MagicSpam from LinuxMagic to empower its customers with self-service provisioning and keep them happy by protecting servers from spam emails and a range of other common server attacks. OptimaNet Schweiz AG was founded in 2003 to provide online services of all kinds, including virtual shared hosting on Windows- and Linux-based servers under its hostfactory.ch brand. Since 2009, hostfactory.ch has also been offering virtual private servers. All of its servers are managed using Parallels Plesk Panel. Altogether it manages around 150,000 mailboxes across almost 20,000 domain accounts for small businesses and consumers on its Parallels Plesk Panel nodes. One of the most critical elements in ensuring customer satisfaction for OptimaNet's hosting business is how it manages spam and other potential threats to its customers' accounts. Over the years, it became obvious that the basic spam solution that the company had in place was no longer sufficient. As Andi Herzig, an administrator at hostfactory.ch explains, "We weren't able to offer our customers' mailboxes enough protection. Our service agents were receiving too many complaints about the volume of spam they were receiving, and the number of false positives which are messages being labelled as spam that were actually from approved senders. We needed to look for a better solution." Fortunately, they learned of a solution that was suitable for Parallels Plesk Panel on both Linux and Windows &dash; MagicSpam from LinuxMagic. MagicSpam for Parallels Plesk Panel is an easy to use, simple to install module that rejects spam at the SMTP level. That means MagicSpam not only stops the spam, it stops a lot of the other attacks as well and protects before the server has to process them. This keeps bandwidth and CPU loads down, as well as ensuring that the server is not simply 'bouncing' spam mails, which can mean server owners find themselves on spamming blacklists. "We liked the MagicSpam Parallels Plesk Panel add-on immediately, because it checks mails for spam against recommended best practice before the spam begins to overload the Mail Transfer Agent software that transfers the mail to the client computer. We also liked the great value it offered in terms of the cost of server licences," said Herzig. OptimaNet uses Parallels Plesk Panel primarily because they offer a high level of automation. Using the Parallels Plesk Panel API, customers can manage their hosting plans themselves. As Andi Herzig confirms, "Parallels Plesk Panel provides client and domain administrators as well as mail users a huge number of features to help them manage their hosting accounts independently. It works perfectly. Not only that, the integration of MagicSpam within the Parallels Plesk Panel GUI makes management of MagicSpam very easy." "The results have been impressive." Andi Herzig comments, "About 80% of all incoming mails may be rejected by MagicSpam, even before further checks are performed by content filters, so the MTA never gets overloaded. Our customers' mailboxes are much cleaner as a result, and that has been reflected in a dramatic reduction in complaints about high spam levels and false positives. Ultimately, that means our customers are much happier." However, as Andi Herzig is keen to point out, the relationship that OptimaNet has with its hostfactory.ch brand. Parallels is at the heart of this success. "Our partnership with Parallels is very, very valuable for us. Only with the help of Parallels Plesk Panel and Parallels customer support is it possible to serve so many clients with so few administrators. The automation of processes and the independence Parallels Plesk Panel gives customers is outstanding. And Parallels staff are always keen to help &dash; you never feel like you have to solve a problem on your own." OptimaNet intends to grow its customer base and the number of domain accounts it manages significantly over the coming years, powered by Parallels Plesk Panel and MagicSpam. Andi Herzig concludes, "If you are managing one or several servers and a high volume of incoming mails, using Parallels Plesk Panel together with MagicSpam will help you ensure customer mailboxes stay really clean, while still keeping your costs low." July 7th, 2011 VANCOUVER, BC: LinuxMagic is proud to announce the sale of their flagship Email Platform, "MagicMail" to six different Kentucky based ISP's and Telco's in the month of July alone, as they continue their expansion in the US marketplace of Tier Two ISP and Telecommunications companies. LinuxMagic is a Canadian Software development company with offices in Vancouver, British Columbia and San Jose, Costa Rica specializing in products for the ISP, Telecommunication and Hosting sectors, and a world wide reputation for their Carrier Grade Email Platforms and Spam Protection technologies. These latest sales mean that nearly 20% of the people in Kentucky who use one of the Tier Two ISP's for their internet connectivity will be using the MagicMail platforms for their daily email communications and spam protection. LinuxMagic first started exporting MagicMail to the US market almost ten years ago and has grown their market presence since. With an extremely loyal customer base, and almost 95% of it's revenue from the export market, LinuxMagic is clearly emerging both as a leader in this space, as well as a Canadian Software success story. With the increasingly competitive markets, Telco's and ISP's realize that the email platform can make real difference in costs, and in competitive advantages. Email is still the main form of daily communication, an essential service to their customers, but email is so much more complex today that developing custom in house solutions is no longer an option. Michael Peddemors, President/CEO stated, "What we do, and we have always done, is make 'Email Simple Again' for our customers. Because the US market has a much larger Tier 2 ISP market, it was always natural they would come to us first. Not every company can keep up with the technology, the costs, and the expertise to deliver what customers now expect from their carriers in terms of email products and protections." Sales Manager, Aaron Wuerch adds... "Our customers love MagicMail because it is simple and effective. They know, in order to keep customers, you have to give them quality email services." MagicMail is an on premises low cost carrier grade solution specially designed for the needs of ISP's and Telco's with their specific niche market. LinuxMagic was prescient in seeing the market demand and potential. It's expertise in this market has also developed extreme customer loyalty. "The amazing thing is our customer satisfaction in our company and our product", adds Aaron. "Our customers are our best references, and we experience virtually zero customer churn. Our very first customers are still with us, and the praise we get from them to other prospective clients really helps us as we increase market share." Jared Simpson IP Engineer at OTT Communications, a recent new customer supports this by saying "As soon as I saw MagicMail for the first time I knew I wanted it... LinuxMagic has done a great job of developing the most complete email server package I have ever used. Our migration was flawless and the system is so intuitive that my email provisioning team was trained in no time and never missed a beat. The support team takes every question seriously and always gets back to us quickly with very detailed answers to our questions. The servers are rock solid and our customers are happy; We absolutely made the right choice when we decided to make MagicMail our new email platform." Mr Peddemors also continues to be excited about the company's successes. "We are proud of our success, as a technology company and as a Canadian export company. Being a Vancouver success story, even in these challenging economic times is a testament to our opportunities on the world stage." "This is only the beginning. We see even greater potential in the future in the emerging markets, especially in Latin America. We continue with +20% growth in the US market, and we only see greater growth potential going forward. We just opened a 2nd office in Costa Rica, and we hope to quickly add to the millions of users who already use our platforms, we are constantly looking for ways for our clients to be more competitive, the generate stronger loyalty and new revenue opportunities in their customer base." APRIL 29th, 2011 VANCOUVER, BC: LinuxMagic is proud to announce that they have launched a new employee incentive/bonus plan based on a Costa Rican employee bonus model, and now all their employees will have another present to look for in December. LinuxMagic is a Canadian Software development company which has recently launched a new office in Costa Rica to better service the Latin American markets, and already the culture is rubbing off back at the Vancouver Head Office. In Costa Rica, it is customary for employees to receive not just 12 months wages from their employers, but they also receive a 13th month's pay which is paid on December on top of their normal pay for December. From the first time LinuxMagic's President/CEO “Michael Peddemors” heard of this policy, he thought it was a great idea for all businesses to adopt, and the new office in Costa Rica was a great time to implement it at home. “I used to wonder at how happy everyone was in Costa Rica during December, and I used to think is was just a cultural thing, or just because of the upcoming holidays, however when I heard about the employee bonus plan that is dictated by law, I thought this was a great idea in so many ways”, say Mr. Peddemors. “If we give a small bonus every month, it could never give that same pleasure, it would just be used for one more latte, one more dinner, or maybe a little better clothes, but the person's life would not really be changed.”. Michael adds.. “Giving them a larger lump sump, especially with Christmas and Holidays ahead, can make a world of difference. They can buy the bigger gifts, like putting down payments on cars, big screen TV's, rings for the fiance, or trips for the family”. And with the whole country all getting that extra payday at the same time means the store owners are doing booming business. That 'free' money isn't spoken for already by their day to day bills, and that means everyone is walking with a bounce in their step, a smile on their face, and a very brisk positive push in the economy. This new direction might be just what the economies need in other areas, to help stimulate spending, and making the holidays just a little bit more enjoyable for everybody. APRIL 28th, 2011 VANCOUVER, BC: LinuxMagic is proud to announce that they have released their latest MagicSpam® Spam Protection updates, including the 64 Bit version for MailEnable email servers, and a production release of MagicSpam for Zimbra. MagicSpam makes spam protection simple to use, simple to install for those email servers that do not already have effective spam protection built-in. MagicSpam was developed from real world experience in controlling spam for hundreds of ISP's around North America with MagicMail servers, and now much of that same protection can be available for users and administrators of other email platforms. MagicSpam concentrates on effective SMTP Layer spam protection, giving a much better 'Zero Day' protection against Trojan and Bot generated spam, which accounts for the majority of the spam being generated today, however it also realizes that making spam protection easy is more important than ever. MagicSpam comes complete with full logging, statistics, graphical interfaces, custom controls, whitelist/blacklists, BMS™ reputation checks, hostile sender identification, Mail Server Profiling tools and many more features normally only available to those with the Carrier Grade MagicMail solutions. With this release, more users of other email platforms such as Zimbra and MailEnable can get all of these protections in simple to install package for only pennies per day per server. January 4, 2011 - Vancouver, BC: For those subscribers using the MagicSpam for MailEnable integration package, LinuxMagic, the creators of MagicSpam, are proud to announce the release of a new method of integration as developed jointly between the developers at MailEnable and LinuxMagic. This new integration method has been proven in trial testing to increase efficiency of stopping spam BEFORE it has to be processed by the server by a significant margin in the upwards figure of processing at 5 times the speed. May 12, 2010 - Vancouver, BC: LinuxMagic is pleased to announce the latest release of MagicMail 1.3 now available for download and installation. The latest release of MagicMail Version 1.3, is an important upgrade to the base operating system, modelled on the Ubuntu LTS (Long Term Support). This ensures that the system will be stable and secure for years to come with the stability of a Debian based packaging systems, the strength of the worldwide Ubuntu community, and backed by the LinuxMagic team to keep customers email servers up to date, and easy to use. MagicMail 1.3 is a major release, and LinuxMagic developers are moving forward on building out on the 1.3 product line over the next few months. Here is why the MagicMail 1.3 email server platform is popular with ISP and Telcos. As a comprehensive release and improvement, MagicMail 1.3 represents a major upgrade to the underlying operating system (Debian;Ubuntu), and the expert in-house LinuxMagic Support team will be providing the upgrade. To ensure a smooth transition, customers are requested to contact the support team support@linuxmagic.com to schedule a convenient time for the upgrade. LinuxMagic is a leader in developing anti spam solutions for the ISP and Telco markets. As a member of the Canadian Anti-Spam Task force and the number one Linux Development house in the Pacific Northwest USA, LinuxMagic continues to provide technology specifically targeted towards customers looking for simpler integrated solutions for their mail servers. For more information on MagicMail please visit www.linuxmagic.com/products. February 22-24, 2010 Miami, Florida. LinuxMagic, the creator of MagicSpam for Parallels Plesk, will be attending the 5th annual Parallels Summit. Visit us at the Parallels Marketplace where MagicSpam will be a featured product among the Parallels Partners. MagicSpam is an anti-spam product designed for specific email server solutions to target spam and junk mail, and remove it before it gets in your inbox. This is the ultimate spam protection package that's easy to install and easy to use. Visit http://www.magicspam.com for more information about the MagicSpam solutions that we offer. MARCH 20th, 2009 VANCOUVER, BC: LinuxMagic, the creator of MagicSpam, has discovered that significant levels of spam are coming from legitimate servers. Using the data collected from UCEPROTECT's backscatterer database, LinuxMagic released a report containing backscatter levels from email servers and is working to help these email operators eliminate it from their servers. Backscatter is collectively known as the unwanted email generated by email servers which attempt to 'bounce' spam emails. Bouncing emails is a normal part of the email server job and using best practices can avoid most forms of backscatter. However, there are still a lot of email servers that do this incorrectly and are at risk of being blacklisted. Spammers bypass server filters using valid email addresses, also known as forging or spoofing. Servers then bounce the spam to the forged 'from' addresses which can generate thousands of bounces to the victims mailbox. Spammers often target such servers without the protection or proper protocols because they can use them to bounce spam, masking their original source and making the email look legitimate. Most email servers are designed to 'block' such attacks, but according to the statistics gathered over the past 45 days on the UCEPROTECT backscatter page, over 300,000 email servers are actively sending backscatter. LinuxMagic ran a report against those listed sources and discovered some interesting facts http://probethenet.com/results. One of the reasons that the United States produces so much backscatter is because it has a large number of internet hosting companies that offer email services. The operators of these email servers may be unaware of backscatter or unable to stop it. Of course this causes a problem for hosting companies which may find their networks blacklisted because of the backscatter coming from their IP addresses. LinuxMagic created MagicSpam, an Anti-Spam product for email servers that provides an answer for the industry looking to reduce the risks and problems associated with being blacklisted. MagicSpam does this by working with the existing mail server to provide an easier way for email operators to stop backscatter coming from their mail server (http://www.magicspam.com). LinuxMagic is a leader in developing anti spam solutions for the ISP and Telco markets. As a member of the Canadian Anti-Spam Task force and the number one Linux Development house in the Pacific Northwest USA, LinuxMagic continues to provide technology specifically targeted towards customers looking for simpler integrated solutions for their mail servers. UCEPROTECT-Network's core database is fed by a cluster of more than 50 UCEPROTECT-Servers (Executive-Members) located in Germany, Austria, Switzerland, Canada and Australia. Vancouver, BC - Jan 26, 2009 LINUXMAGIC, a Vancouver based software company has announced today that it has just reached a deal for its 'MagicSpam' Anti-Spam technology with, PARALLELS, a world leader in products for the hosting service provider market. LinuxMagic and Parallels have teamed up to offer 'MagicSpam' as the Anti-Spam solution for Parallels worldwide customer base. LinuxMagic has built a world wide reputation for it's email and anti spam technologies, and being chosen by a company with the size and reputation of Parallels as a vendor for its Anti-Spam validates that reputation. The technology underpinning 'MagicSpam' is already in use protecting millions of users at major ISPs and Telcos throughout North America as 'MagicMail'. This was supported by Parallels's VP SaaS, Soeren Von Varchmin. “We know that being able to provide our customers and vendors with cutting edge spam protection at just a click of a mouse, and partnering with a company of LinuxMagic's expertise and proven technology is a win-win situation." MagicSpam is a unique approach to anti-spam that offers zero-day protection in a manner that stops spam and attackers with greater flexibility, and without the overhead of traditional filtering techniques. Lowering overhead and bandwidth is especially important to the hosting service providers, and spam protection is essential for all email servers. Reduced support costs, improved email services, and simple to use tools for their customers help to eliminate industry pain points. LinuxMagic continues its reputation for Anti-Spam products by releasing some of its tools in a module specifically designed for the Parallels/SWSoft product "Plesk". This product is specifically designed to do more edge level protection. This helps to keep the majority of Spam offenders out before the filtering stage, improving performance and reducing backscatter. This product should be especially attractive to hosting companies that resell Plesk products as a economical way to provide the best of MagicSpam protection, at a cost that is attractive to their customers, and yet allows for additional recurring revenue streams. A new website and store have been created to make it simple to purchase, simple to install and easy to use. www.magicspam.com has more information on this product and pricing, however the unlimited email address protection fits well into the pricing model that Plesk customers are used to. "MagicSpam for Plesk" is based on MagicMail's tried and true Anti-Spam technology used to protect millions of users at ISP's and Telcos throughout North America. President/CEO Michael Peddemors is excited about this product launch. "This is the first step in making our Spam protection available for other products and Platforms, and choosing Plesk as a first product seemed like the logical choice." Parallels strong penetration in the hosting market, and being able to fill a void and make the Plesk server experience even better at a price that is attractive enough for wide spread adoption is a wonderful experience, and we hope to release the same protection for many other products in the near future." The MagicSpam website also holds information that is meant to help owners of other email solutions that want the protection of MagicMail, but are already committed to another product. Recent customers comment on the simplicity of the product install, and it's seamless integration with Plesk, however the technical staff at LinuxMagic indicate this is only the beginning. LinuxMagic is about to release its latest release of the MagicMail product, built especially for ISPs and carriers. And the company is excited about its latest offering which include more enhancements to the interfaces for both end users and administrators, and making Anti-Spam protection even easier and more flexible. President/CEO Michael Peddemors had this to say about the upcoming release. "It is all about making life easier both for email administrators and for customers... Especially in the ISP/Telco markets. And now with the updated statistical analysis tools, and updated SMTP daemons, ISPs can expect even lower call counts at the support desks, and better customer loyalty." Mr. Peddemors went on to add, "The surprising thing is how easy Spam is to control with a good mail server. Why should a person have to pay for spam filtering on top of their mail server when the mail server can do spam protection more efficiently by itself." The LinuxMagic team points out that its edge level technology does a better "Zero Day" protection than standard filtering methods, and that with a few simple tricks any mail server can block over 95% of the traffic its mail servers are subject to without the burden of risking false positives. A recent study showed that a typical email server can block 2/3's of the traffic with simple valid user checking, 1/3 of the traffic just by checking the HELO, 1/3 of the traffic by checking if there is reverse DNS present in MTA-MTA traffic. The problem is a lot of other email servers are not flexible enough to differentiate between customers emails and inbound spammers, and/or not designed to check this information BEFORE the server accepts the messages. The flexibility of MagicMail makes it so easy to use Anti-Spam 'Best Practises', while still allowing customers to 'tweak' their own personal settings. This, and MagicMail proprietary spam protection help to ensure that Spam is blocked in a way that works for ISPs and their customers, while reducing the overall costs of customer support as well as the cost of running and maintaining mail servers. Protecting millions of mailboxes, the latest release is sure to be a big hit with the telecom industry. For more information, visit the MagicMail website. LinuxMagic is pleased to announce that the SpamRats database now allows mail servers to block over 50% of unwanted email and spam. 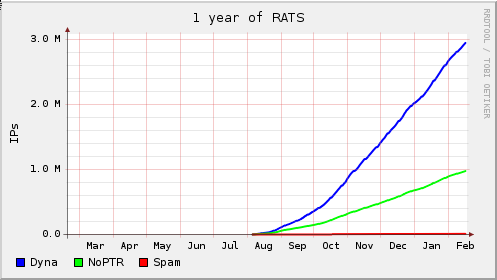 SpamRats is in use at ISP's throughout North America, and because of the unique detection tools available, the RATS IP reputation databases which have now reached over 20 million IP addresses, representing mostly infected PC's, Trojans and Bots used to send out Spam, dictionary attacks, and brute force password attacks. These Trojans and Bots sources are responsible for 50% of the traffic detected at mail servers. Because of the wide deployment of MagicMail servers throughout North America, MagicMail servers have been able to act as an early warning detection grid to detect new trojans, bots and other abusive sources. These 'worst offenders' are added to the public lists available at SpamRats within hours of detection, enabling not only MagicMail servers, but other email servers as well to block any mail connections from these locations. This detection technology has been showing significant results, and now that SpamRats has listed over 20 million IP Addresses in it's database which are associated with machines controlled by spammers, it is now among the top IP reputation lists available to the general public. MagicMail is known for blocking more than 90% of all inbound mail attempts, BEFORE data acceptance. This 'zero day' approach also helps stop new Spam techniques before they are created. And the tools use to detect Trojans and Bots are extremely effective, as shown by this detection chart. With over 5 million IP addresses on RATS-NOPTR list alone, (IP Addresses with no reverse DNS) that mail servers never need accept a connection again, this has a huge impact on system resources from some of the worst types of attackers and spammers. President/CEO Michael Peddemors was quoted as saying, "IP reputation is the most efficient form of protection, and our reputational databases and our data collection methods will place us a leader in our field by years end. There is only a finite number of IP addresses available, and there is no reason to allow the Trojan and Bot affected personal computers in the world to keep sending out Spam and attacking mail servers, once they are detected"
SpamRats Database now has over 4 million IP addresses listed in its worst offender database, representing mostly infected PC's, Trojans and Bots used to send out Spam, dictionary attacks, and brute force password attacks. And these Trojans and Bots sources are responsible for 20% of the traffic detected at mail servers. These represent the worst sources of attackers and spammers detected by the Spam Rats detection tools. LinuxMagic's flagship email server product 'MagicMail' with it's built in Anti-Spam technology, designed for the ISP and Telco's has been using IP reputation in it's servers to help block connections from Trojans and Bots, to reduce server loads and help in the fight against Spam. Because of the wide deployment of MagicMail servers throughout North America, MagicMail servers have been able to act as an early warning detection grid to detect new trojans, bots and other abusive sources. These 'worst offenders' are added to the public lists available at SpamRats within hours of detection, enabling not only MagicMail servers, but other email servers as well to block any mail connections from these locations. This detection technology has been showing significant results, and now that SpamRats has listed over 4 million IP Addresses in it's database, it is now already blocking 15-20% of inbound connections. And with the other IP Reputational tools, MagicMail is blocking more than 90% of all inbound mail attempts, BEFORE data acceptance. This 'zero day' approach also helps stop new Spam techniques before they are created. With over 1 million IP addresses on RATS-NOPTR list alone, that mail servers never need accept a connection again, this has a huge impact on system resources from some of the worst types of attackers and spammers. And if the 25% increase per month continues, then by years end, SpamRats will have detected over 50 million IP's, roughly the estimate of the amount of infected PC's worldwide. In 2007 the estimates or infected PC numbers ranged from 6 million to 20 million, but with the increasing use of home PC's in emerging foreign markets, this number is expected to increase. With the recent court judgment that ruled in favour of anti-spam company Kaspersky Labs, the courts have now given Internet Service Providers (ISPs) and their customers the right to 'Just Say No...' to email marketing and other types of spam. Wizard IT, a leading Canadian anti-spam solutions provider, is delighted with the outcome of the case, which now gives consumers and their Internet providers the legal right to restrict access to material that the provider or user considers to be "obscene, lewd, lascivious, filthy, excessively violent, harassing, or otherwise objectionable". The lawsuit against Kaspersky Labs was launched in The U.S. District Court for the Western District of Washington by Zango, an online media company, to try and get its programs reclassified as non threatening and to prevent Kaspersky's anti-spam and security software from blocking its programs. With a decision in favor of Kapersky's anti-spam program, the courts set a precedent which would give ISPs the right to track, label and even block spam and malware that might be harmful to its customers. Michael Peddemors, President of Wizard IT, Services has always believed in the rights of people to limit the amount of emails they receive from email marketing companies. "We are very pleased with the judgment because it supports our belief that consumers have the right to choose what emails they receive and what emails they reject. I strongly believe that the protection of consumers must be the main priority of all ISPs and email operators," said Michael Peddemors. Blocking email has always been a controversial issue. It pits the rights of the receiver over the rights of the sender. The recent court case involving Kaspersky labs and other recent court cases, like E360 Insight vs The Spamhaus Project, a large anti-spam BlackList provider, is proof of this controversy. Josh Wilsdon, Vice President of Technical Development for Wizard IT Services, says that the recent court case gives anti-spam companies some valuable legal precedent to support them when facing legal challenges in the US. "As an IT company and email software provider, we saw a rise in unwanted commercial email being sent to our customers. This prompted us to develop two products, MIPSpace and SpamRats, which specifically deals with the rise in spam, malware and abusive email marketing. We wanted to give consumers and ISPs a choice as to which senders they wanted to receive mail from and which they would reject. The recent court decision for Kaspersky helps lay a foundation of precedent which will support us as we continue providing this choice to customers." As security threats continue to plague email and Internet users, consumers are expecting that ISPs and other email operators are adequately checking for spam and other security threats before legitimate email is sent to their email in-box. While the methods of combating various types of spam have not changed, with this ruling, ISPs, security vendors and consumers now have broad discretion in determining what is or is not spam and malware and the legal right to 'Just Say No...' to email marketing and other forms of intrusions. LinuxMagic a leading edge provider of Mail Server software and anti-spam solutions has agreed to provide its 'MagicMail' high volume email solution to Delmarva Online, a large Internet service provider based in Salisbury, Maryland. Delmarva has chosen LinuxMagic's server software, MagicMail, and anti-spam technologies to provide email and spam protection services for its customer's 45,000 email boxes. By selecting MagicMaill's high volume email and anti-spam package, Delmarva will now better protect its customers and dramatically reduce its email administration costs. SURREY, BC -- Wizard IT Services As security threats continue to plague email and Internet users, Wizard IT recently launched its newest project, SpamRats.com. The much anticipated SpamRats project is now up and running and is being introduced as a 'Solution Set' of fully-automated and free Real Time BlackLists (RBLs), designed to target various Trojans, Bots, infected PCs and other IP address which are being used to send out spam. Building on its reputation as a leader in anti-spam technologies, Wizard IT is now offering the public these anti-spam tools for free through the SpamRats website (www.spamrats.com) and through MagicMail, a product offering from its sister company LinuxMagic. The tools provided on the SpamRats website are designed to be used use by anyone and on almost any email server. ways for Internet service providers to reduce overhead, bandwidth, and the amount of Unwanted Bulk Email (UBE) received. "It is a 'Zero Day' protection approach that is needed to stop the millions of Trojans and Bots that send spam or attack servers. People need to be protected against new and unknown threats before the vulnerability is discovered and exploited," said Mr. Peddemors. He added, "we have seen the progression of how Spammers have tried to get around filters. At first there were plain text spam messages, then it was spam in attachments, after it was spam hidden in images, then it was in PDF's, and now we see Spam in WAV audio and voice messages. Spammers will always try to get around the filters because there is so much money to be made, but if you can stop the connection at the point when you determine it likely to be an infected PC or a spam engine, then you get 'Zero Day' protection. If you know what is going to be sent to you is infected or abusive, filtering technology 'should not' be your first line of defence." wanting to deploy the SpamRats RBL's should visit www.spamrats.com. Whalley's LinuxMagic will be part of a mission to Asia to promote Canadian technology. The mission is co-sponsored by the National Research Council of Canada and Monte Jade and will visit China, Korea, and Hong Kong. LinuxMagic specializes in developing software to run on the Linux operation system. Company president and CEO Michael Peddemors said being chosen for the Asian trip will consolidate the firm's position as a leader in the Pacific Northwest. With such a large market looking at Linux development, they are going to need strong partners in this region, Peddemors said. Vancouver, Linux and LinuxMagic all stand to benefit. Surrey, BC -- December 10,2003 -- LINUXMAGIC today announced successful completion of it's Linux-based, thin client 'WorkPlace' solution for all BC FitnessWorld locations. The project included replacement of Windows desktops and implementation of 60 thin client workstations using LinuxMagic's own network integration solution, 'WorkPlace'. The project is estimated to reduce FitnessWorld's annual cost of desktop ownership and support by $2,000 per workstation, and allow FitnessWorld to more easily expand its future operations in the areas of personal training, wellness, and fitness services. Ivan Beletsky, Senior Systems Administrator for FitnessWorld, had this to say about the new 'WorkPlace' solution. "WorkPlace environment provides our IT team with such essential features as centralized administration, rock-solid stability, self-monitoring, and high performance. Currently we have 2 technicians supporting over 200 end users where Workplace is deployed. These inexpensive Intel servers with mirrored hard drives running Linux WorkPlace never go down and don't need to be rebooted every several weeks for performance reasons, unlike some other proprietary server operating systems. If there is a hardware problem with a thin client, it takes us only 10 minutes to replace it and have it available for end users because no installation or configuration is required on the client". Adoption of Linux-based solutions reflects a growing world-wide trend. In May of this year, the City of Munich announced its intention to adopt Linux for 14,000 of its employees. Companies like Google and Amazon have been using Linux for years. School districts in Los Angeles and Portland, Oregon are beginning to use Linux to manage key IT functions. And the recent announcement by Novell to purchase (with IBM support) the German Linux company, SuSE, reflects a clear recognition by many in the IT industry that Linux is a viable, if not preferable, alternative to Windows solutions. The decision for FitnessWorld to adopt not only a Linux-based desktop solution, but a thin client one as well, shows foresight. Thin client workstations have no CD players, diskette drives, or expansion slots. This not only helps protect the security of enterprise data, it significantly cuts down on hardware costs. With no moving parts, thin client workstations last far longer than their PC counterparts, and consequently, are a much more affordable long-term solution. Systems administration is managed entirely at the Server level, making overall systems support much easier. And software licensing fees are significantly reduced. Michael Peddemors, President and CEO of LinuxMagic had this to say about his company's 'WorkPlace' solution. "The switch from Windows PCs to the LinuxMagic operating system and a thin client solution like 'WorkPlace' is a no-brainer. It's hard to argue with a solution that lowers your costs by thousands of dollars per workstation, eases your adminstrative and maintenance workload, and improves your data security, all while allowing you to continue doing everything you currently do". Peter Schmit, Director of Marketing and Sales at LinuxMagic had this to add. "We are extremely excited about our thin client desktop solution, and so are our clients. It is an ideal, low-cost workstation solution for organizations like FitnessWorld. Other great candidates for this technology include educational institutions, governments, non-profits, and the financial sector. Both the thin client hardware and our LinuxMagic software are mature, enterprise-ready products that can be reliably deployed virtually anywhere, and integrated with existing systems." Other companies and organizations that have embraced Linux or solutions like 'WorkPlace' include Toronto Children Services Division, City of Miami, Merrill Lynch, Air New Zealand and HSBC in Hong Kong. FitnessWorld of BC can now be added to that distinguished list. Surrey, BC -- June 12, 2003 -- LINUXMAGIC Software today announced completion of sales of it's Anti-Spam 'MagicMail' Server to DSL EXTREME and ALLWEST COMMUNICATIONS. DSL EXTREME is a major California Internet Service Provider (ISP) serving over 100,000 accounts, and ALLWEST COMMUNICATIONS is a large Utah based communications company. Sales to these organizations continue to prove the versatility of LinuxMagic's Mail Service offerings, and the recognition of how important Anti-Spam controls are to their customer base. The 'MagicMail' Server is one of the first complete 'All in One' solutions offerings a complete Email Delivery System, and designed to completely protect their customers from Spam and Virus's. In addition, it offers 'Simple to Use' customer tools to pro actively stop 'Future Spam'. LinuxMagic recently released this complete package which contains all of LinuxMagic's Specialized High Performance Email Tools, tools used in servers serving over 10 million emails per day. LinuxMagic released these tools in a complete package that offers unlimited user licensing, and runs under LinuxMagic's own customized Linux Operating System with a complete Administration Package. Spam has long been a thorn in the side of businesses, and the ordinary email user as well, but it is LinuxMagic's use of Anti-Spam technology right at the mail servers, which is the innovation to completely protect the clients. Spammers know that not everyone is going to protect their personal email accounts, and until this Spam is stopped at the servers, spammers will continue to make money and bog down the Internet. And as well, 'The Gartner Group' has been reported as saying, "74% of customers believe the ISP is responsible for Spam problems, 36% of customers would switch ISP's to stop Spam, and that 24% of customers would pay a fee to stop Spam." That is the why LinuxMagic's 'MagicMail' Server is receiving such attention. Long known for being one of the Premier Linux Support and Development Houses, LinuxMagic is pleased that it's product offerings are receiving the same kind of accolades that it's Support and Service Contracts have garnered. "We are planning on bringing more of our specialized program offerings to the market, and the acceptance of these products by such major players shows other companies thinking of replacing their legacy Softwares, that Linux Applications can be cost effective, offering more service and protections for their users and customers." Says Ray Worth, Marketing Director of LinuxMagic. "The Anti-Spam capabilities, the power of Linux, and all without the need for skilled technicians, make it so that 'MagicMail' Server can pay for itself within just a few months. It isn't hard to see why these companies are so pleased." President and CEO, Michael Peddemors had this to add. "We have been doing this for years, it is just that we have now rolled it into one simple package. We're proud of the new things our programmers can do to stop SPAM which is now reaching 40% of all email, but it's the power of Linux that keeps it going without interruption. We have been servicing major players like ALLWEST for all their Linux and Mail Server needs for years, but I really like what our new customers have to say about our products"
Dean Russ, Director of Information Systems for DSL Extreme had this to say, "Your MagicMail product has allowed our company to keep up with our rapid growth in terms of scalability and reliability. In addition, the amount of spam received by our customers has been significantly reduced and customers now have the ability to interactively control what comes into their mailboxes. This is truly a great product." As well, Mr. Peddemors added, "As much as I am glad we are doing our part to stop SPAM, we are even more proud to be able to help businesses realize huge savings with Linux, in all phases of business." Surrey, BC -- January 1, 2003 -- LINUXMAGIC is pleased to announce that it has begun deploying its "WorkPlace" servers as a low cost, easy to maintain, and efficient way to replace all the expensive PCs running in an office environment. By using "Thin Client" technology, and Open Source Linux Software, we are able to provide all the tools the average office needs for their staff to perform efficiently, and yet save thousands of dollars per station in hardware and software costs, as well as reducing the administration loads at the same time.